A CHRISTMAS ESCAPE marks the lucky number 13th release in what has become an annual literary event. It is always a pleasure to escape inside an Anne Perry Victorian Era novel, and the yearly Christmas mystery is particularly poignant. Although there is never any mention of the year, A CHRISTMAS ESCAPE carries with it all the same Victorian sentiments as Perry's recurring William Monk and Charlotte and Thomas Pitt books. This is a stand-alone title as it does not feature her regular characters --- which is a nice treat as readers will not be distracted by those with whom they are already comfortable and can dive into a fresh, juicy, all-new tale. 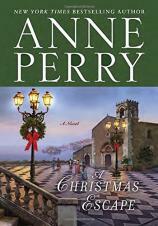 "A CHRISTMAS ESCAPE rivals the classic murder mysteries of Dame Agatha Christie and plays out like a game of Clue. It is easy to forget that this is a Christmas story because the suspense is built up so well." The foreword reads: “To those who believe in starting again.” The very first page sets the tone for all you really need to know. An Englishman named Charles Latterly is on a boat heading for the Italian island of Stromboli. Charles recently lost his wife and wants to spend the Christmas season in a location he has never visited before. Stromboli is no ordinary place. For one, it is a volcanic island, and the cottage Charles is renting is directly in the path of the blast --- should the Tyrrhenian volcano decide to erupt. He is met by his landlord for this brief stay, an agreeable but somewhat secretive man named Stefano. Charles settles in for his temporary escape from the reality of his life in London and a quiet Christmas holiday. However, this being an Anne Perry novel, readers know that matters will quickly become complicated in some way and more than just the volcano may heat up. During an excursion around the grounds, Charles comes upon a 14-year-old British girl named Candace Finbar. She is staying there with her Uncle Roger and a small handful of characters who are sharing Stefano's Stromboli abode for the holiday season. Charles meets up with the rest of the group: Colonel Bretherton, Mr. and Mrs. Bailey, and Mr. Quinn. Quinn is an author who has found some success with a recent bestseller and is working on his next release. The first meal Charles has with all of them is quite interesting, as Mr. Bailey turns out to be an extremely abrasive individual who appears to be at odds with everyone at the table. At one point, Mr. Bailey is attacked by an unknown assailant and proceeds to accuse everyone at Stromboli of having a motive for this unwanted assault. Of course, it is just a matter of time before he becomes a murder victim, but the reasons for the killing will be completely unexpected. Throw into the mix the fact that the volcano on Stromboli actually begins to erupt, and you quickly have a murder mystery set amidst a disaster film. Charles and the others will have to battle Mother Nature as well as match wits with the murderer --- a game that will not end well for these players. A CHRISTMAS ESCAPE rivals the classic murder mysteries of Dame Agatha Christie and plays out like a game of Clue. It is easy to forget that this is a Christmas story because the suspense is built up so well. Of course, all will wrap up like a Christmas present as the power of this magical season once again will prevail over the nefarious deeds that occur within these pages.